A National Reconnaissance Office spokeswoman has said that Space Exploration Technologies is contracted to launch the NROL-76 national security payload into space for the agency in March next year, SpaceNews reported Wednesday. 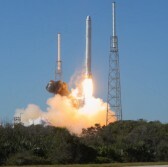 Mike Gruss writes NRO did not disclose which rocket SpaceX will use to lift the NROL-76 satellite at Cape Canaveral Air Force Station in Florida, nor did the agency provide details about the price of SpaceX’s launch services contract for that mission and whether it was competitively solicited. SpaceX’s Falcon 9 rocket launched an NRO CubeSat in December 2010 as a secondary payload for NASA‘s Commercial Orbital Transportation Services Demonstration Flight 1 program, Gruss reports. The report said the company has not publicly disclosed any mission support for NRO after that late 2010 CubeSat launch.